Thank you to Modern Masters for sponsoring this post! The project and opinions are all my own. 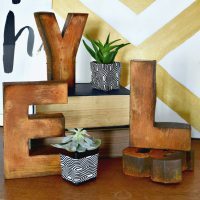 Hello and welcome to another edition of The Monthly DIY Challenge! 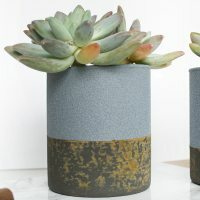 If you’re unfamiliar with The Monthly DIY Challenge, every month some of my favorite bloggers and I team up to create unique projects based upon a common product or theme. 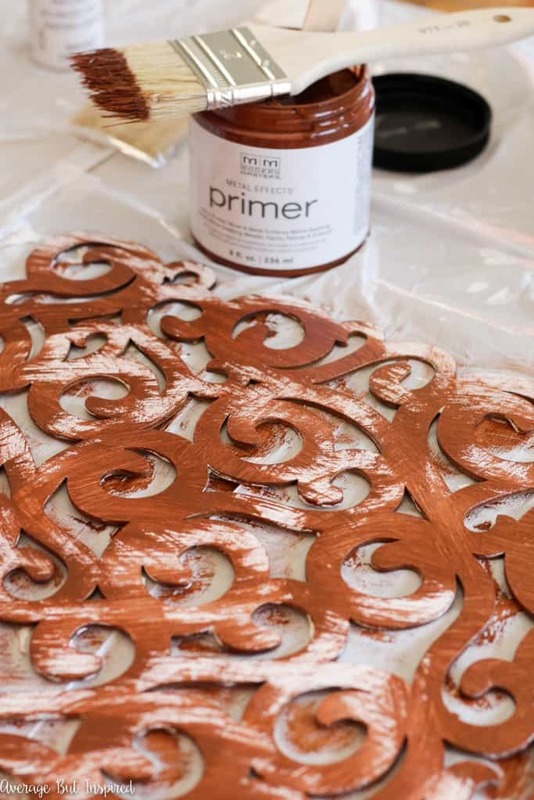 This month we’re all about faux metal finishes, thanks to the amazing folks at Modern Masters and their fabulous Metal Effects paint line. 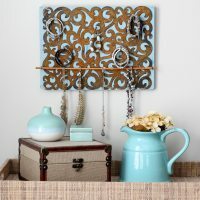 I used Modern Masters’ Metal Effects Rust Oxidizing Finish Kit to create a gorgeous rusty iron scrollwork DIY jewelry holder. 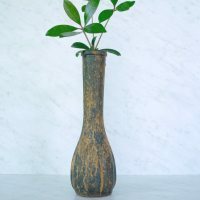 It looks like a piece you’d find at your favorite flea market, don’t you think? 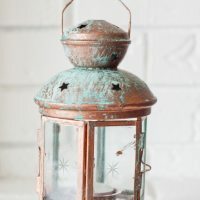 Before I give you all the details on how to make your own version of this project, here’s a teaser of the fabulous faux copper (with blue and green patina), and faux rust projects my friends and I came up with. 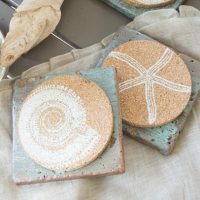 All of the projects are linked at the end of this post so you can click through to view tutorials for each one! 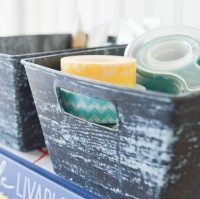 OK, so let me fill you in on how I made this amazingly rusty jewelry holder! 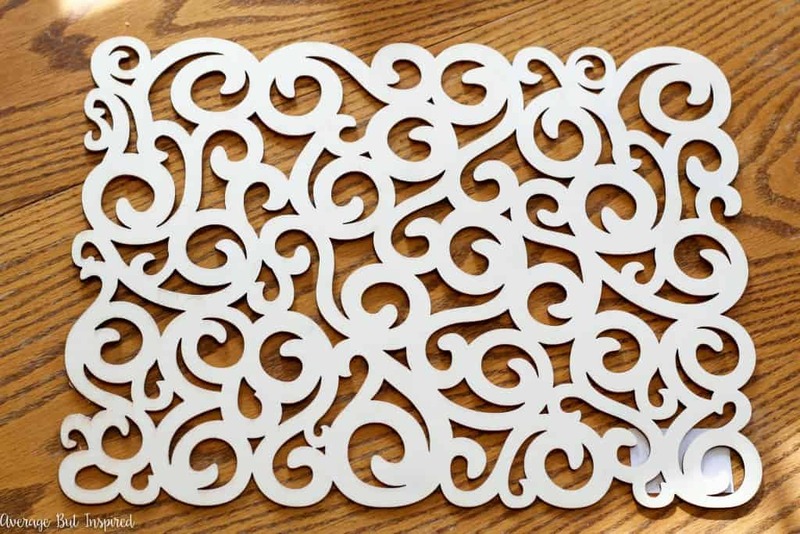 I bet you’d never believe that my “rusty iron scrollwork” was actually an unfinished laser cut wooden plaque that I bought at the craft store, would you? Yep, that’s how it looked when I started with it! But it didn’t take long to transform it into a rusty work of art. 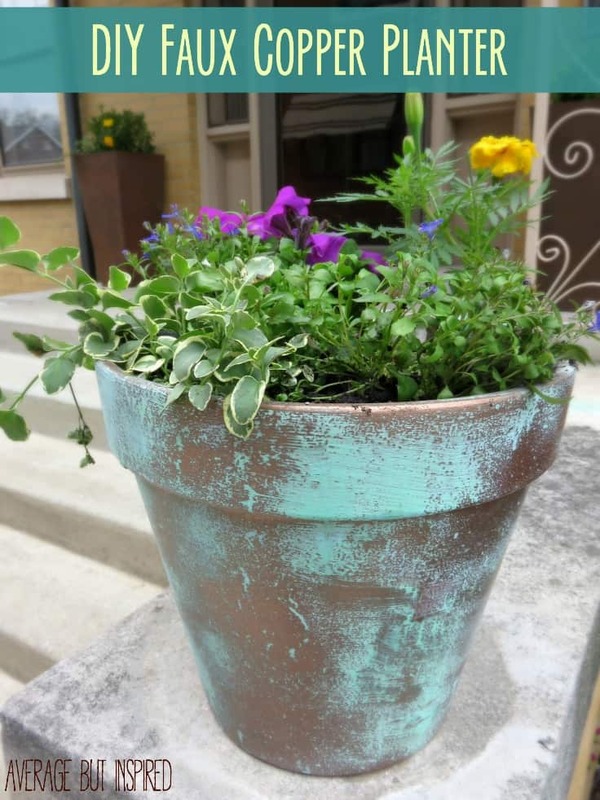 Using the Modern Masters Metal Effects Rust Oxidizing Finish Kit, which you can buy online at Home Depot, I gave it a whole new look (or should I say old look)! First, I brushed on a coat of the Metal Effects Primer that came in the box. After that dried for about 30 minutes, I put on another coat of primer. 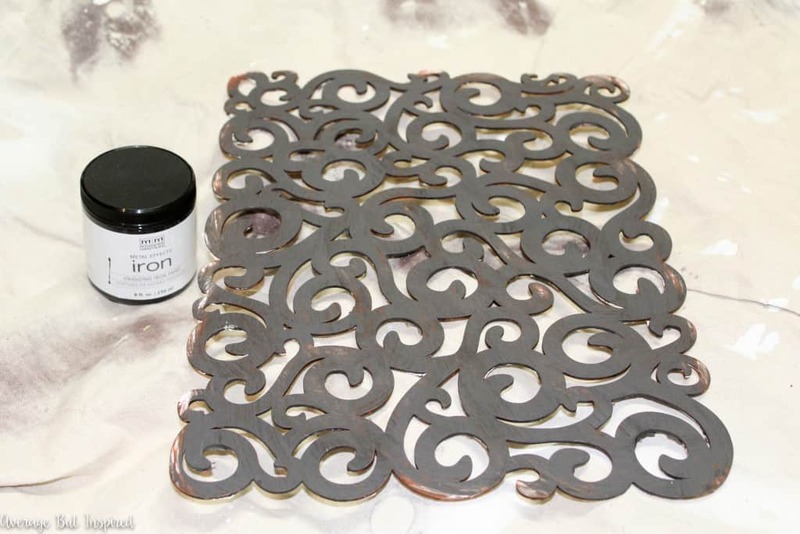 After I let that sit overnight, I painted on the Metal Effects Iron Paint. It went on almost black, which made me a little bit nervous. My scrollwork definitely did not look rusty at this point! After that dried, I misted the entire surface with a couple coats of the Metal Effects Rust Activator. 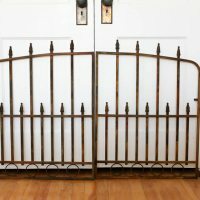 After about 45 minutes, a rusty finish began to appear right before my eyes. It was so exciting! 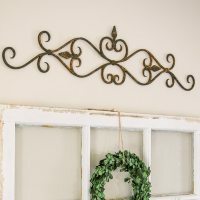 Once all was said and done, I had a gorgeous and authentic-looking piece of rusty scrollwork. I sealed it with the Metal Effects Sealer Permacoat Xtreme that came in the box. Then I used wood glue to attach it to a painted piece of scrap wood. 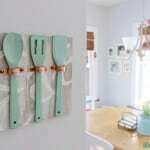 Once that dried, I fastened some cup hooks and a dowel to the board, and turned the piece into a jewelry holder! Look at the variation in tone and color! Isn’t it gorgeous? 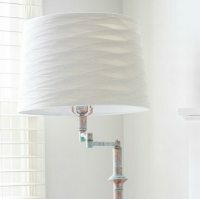 This is NOT a finish that you could achieve with paint alone. 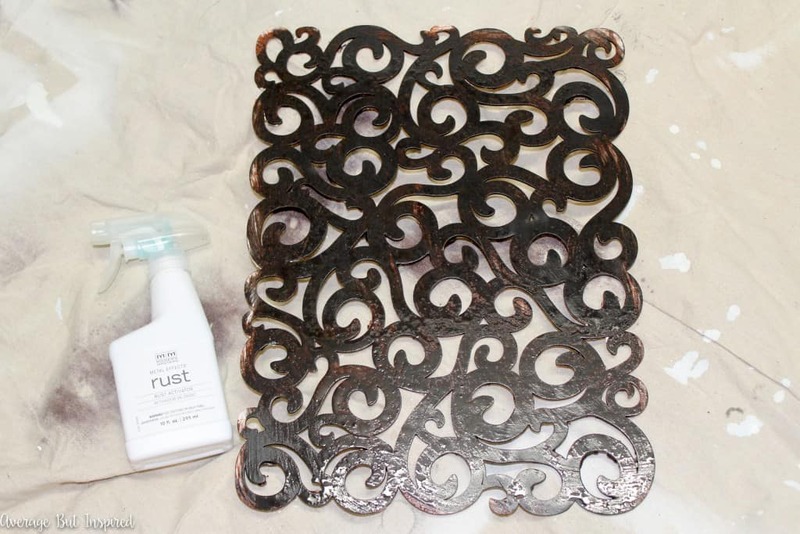 What would you be most excited to give a faux rust finish to? 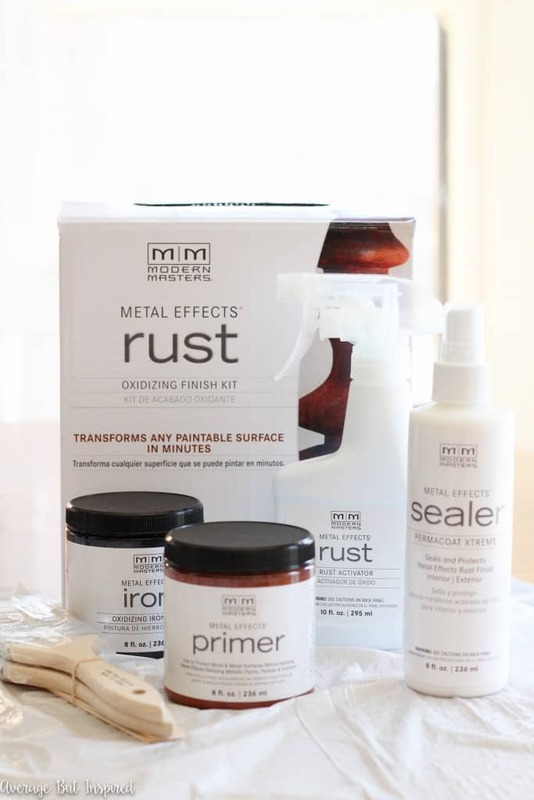 Now that you’ve seen how I used the Modern Masters Metal Effects Rust Oxidizing Finish Kit, be sure to check out how my friends used it and the Metal Effects Copper Finish Kit! 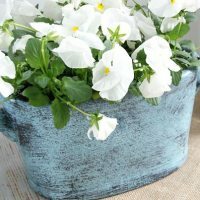 If You Liked This Post, I Bet You’ll Like This One, Too! 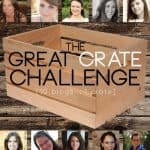 The Great Crate Challenge – My Rolling Firewood Caddy! I’m amazed at what that rust kit can do! 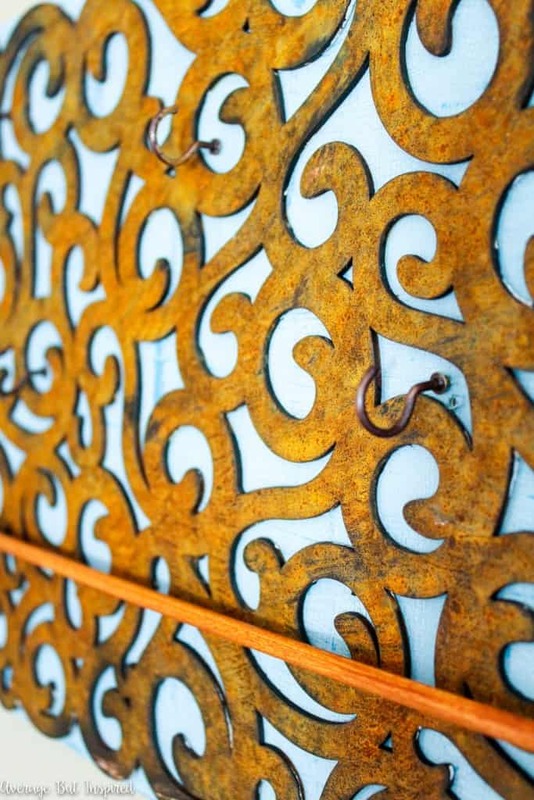 The wood scrollwork really looks like old rusty metal! 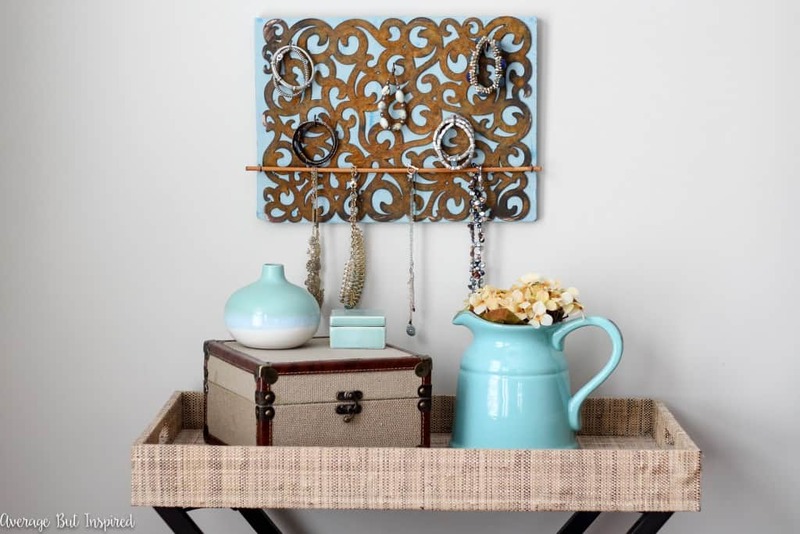 Just a cool idea to use it as a jewelry holder too. It looks so pretty hanging on the wall. ohhh I luve me some rusty things!!! your project is amazing and thanks for the paint tip!!! This is so beautiful, Bre! I love how it pops against the blue background. 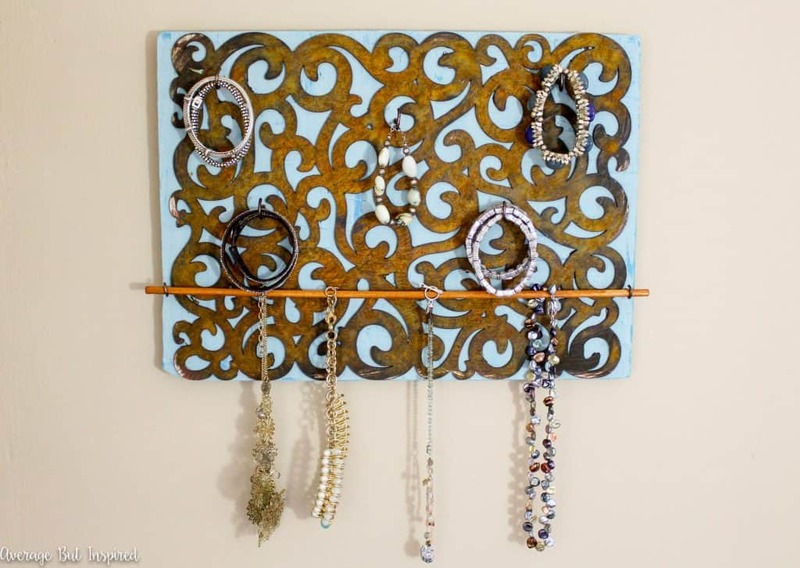 And the jewelry holder idea is genius! Such a unique idea! 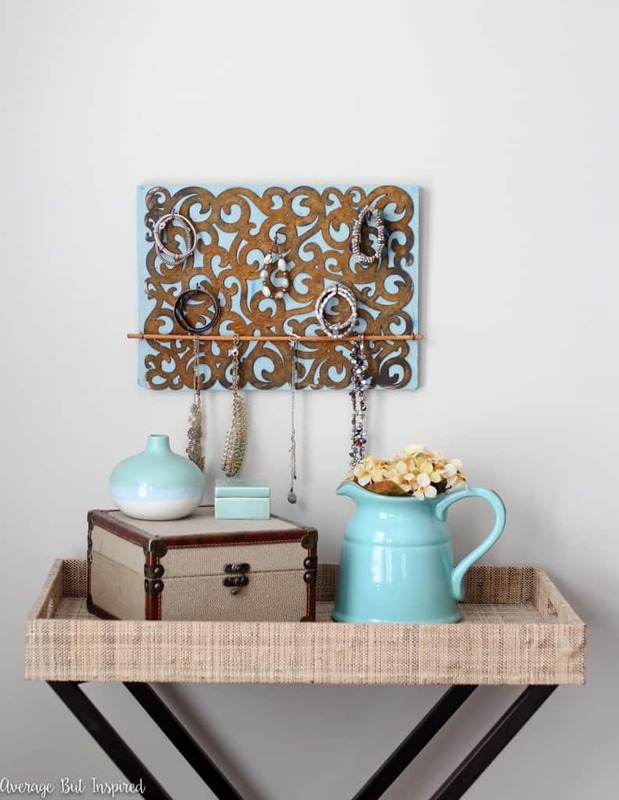 Love the jewelry holder! And the finish came out so beautiful! What a unique and clever idea! It’s so amazing what this paint can do! No, way! Looks like totally legit rust! Love what you did with it, especially against the blue! This looks so cool! I’ve never heard of this stuff before, but I love the way it turned out. Will have to try it! Such an inspiring and unique idea! 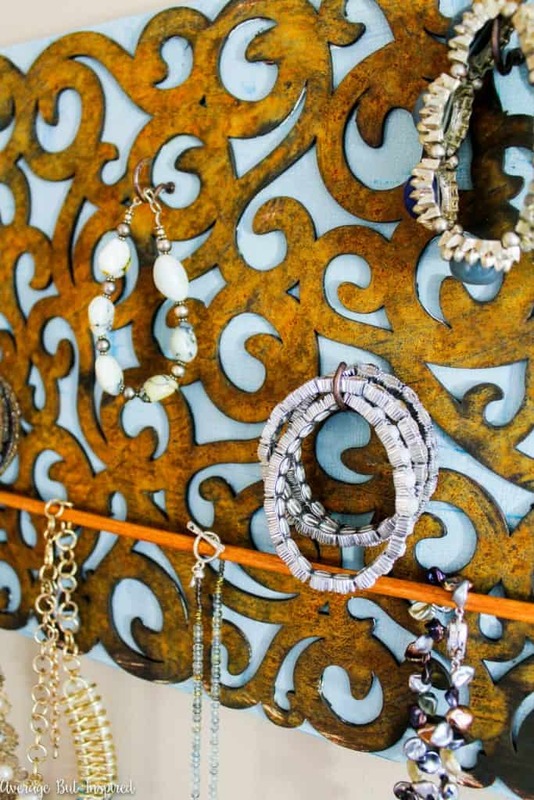 I had no idea it was wood to begin with and how brilliant to turn it into a jewelry holder! 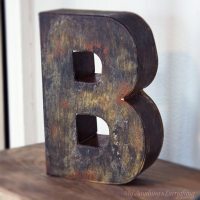 I love the old vintage vibe and it looks so great in your space! This is so cute! I love the look and function of it!